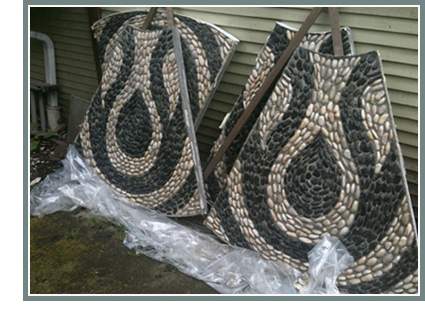 Pebble mosaics can be pre-cast in our studio, or built directly onsite. Both methods use pebbles set in concrete, with reinforced concrete used in the pre-fabricated slabs. More of the pebble is embedded in the concrete than is visible in the pattern above, creating a very stable surface. Great attention is paid to the strength, durability and longevity of the pebble mosaics, and the site is carefully prepared to withstand frost conditions. Other considerations include grading for effective water drainage, and a level surface for ease of walking. Pebble mosaics can stand-alone or be combined with flagstone pavers, bricks, cobblestones, exposed aggregate or other landscaping materials.